What they are: EZ weft extensions are similar to bead sew in extensions. But instead the beads are pre-attached to the extensions and there is no sewing involved, kind of like micro links but the beads are on one whole row of hair instead of individual pieces. A criss-cross technique is used to pull the hair through the beads and then clamped to secure. Who they are for: EZ weft extensions unlike the bead sew in are for women with thin hair. The pre attached beads are much smaller and the technique used is able to hold onto thinner hair. They can work for anybody though. Type of hair needed: EZ weft extensions is a long weft of hair that already have the beads pre attached. 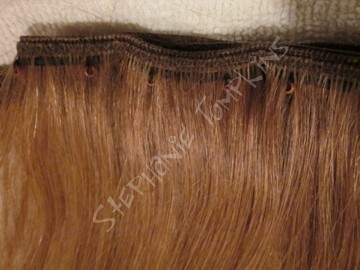 If they are not pre attached they are not EZ weft. Sometimes Images and Shades sells them sometimes Angels Hair Wigs in Kingsway sells them. Usually they have to be ordered in. Kind of hair: The best hair is called Remy hair. Remy is not a brand itself, it is just a type of hair. Remy means the cuticles are pointed in the same direction. This is the healthiest hair, it lasts longer, and reduces tangles. So you can choose any type of brand you want but you want to make sure it is "100% human remy hair". Remy is not cheap. Installation: Installation time takes about 1.5 hours to 2 hours. Installation includes 4-6 tracks which is equivalent to 1 pack of hair with every track singled. Because of the beads I am unable to double tracks. Installation also includes a flatiron and any cutting/blending needed for a natural look. Every installation gets a take home care sheet as well if needed. Cost: $120 for installation. $20 for removal. Cost of hair varies. Hair usually has to be ordered in. The cost depends on the length you want and the quality you want. Side Effects: Headaches are normal the first day but sleep is much more comfortable than the track n sew extensions. It is suggested you take an advil before your appointment and again before bed. Length they last: On average these extensions only last 4-6 weeks (or until they grow out). Tightening cannot be done because of the technique used to secure them. They are a temporary method, but look and feel great. How long they last also depends on how fast your hair grows and how well you take care of them. The faster your hair grows the sooner they have to be redone. Maintenance: Use your leave in conditioner and serum everyday! Serum will help reduce tangles dont be shy. Leave in conditioner helps with brushing so you are not snapping hairs that will eventually matt up. You must brush the hair at your scalp, sections are always a good thing. Removal: Upon removal the bead is reshaped and slipped off. Because of how short a time they last matting usually doesn't occur. You would have to be really not taking care of your extensions to achieve a matt. Removal is half price if a new install is done the same day. Remember that everyday we shed naturally 50-100 hairs. When you have a track the hair has no where to go it is caught in the bead. When your extensions are taken out you will lose hair. This is only your natural shed that has already fallen off. There is very little, it is completely normal. Why you should get them: Because they are painless to install. They look flat and feel very comfortable. They are great for women with thin hair. They are undetectable if blended properly. They are easy on the pockets. They can add highlights or lowlights instantly. They add beautiful lengths and volume. They are the most temporary method of all the extensions so change is easy.